It seems as though there is a lot going on in the painting, however, if you look closer you can see the invisible man and that Salvador used actual objects in the painting to make the man appear slightly. You can see that it is also a one point perspective painting. 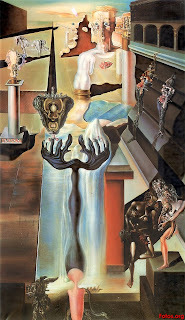 This painting may be showing what kind of emotions Salvador Dali may have been experiencing at the time. I love how sharp the colors are; very bold and they pop right out. Also how he builds the man; he may be stating that the man is not physically or emotionally able to stand for himself, and that he needs others to help him. He may have lost who he is mentally/emotionally. At the bottom right corner of the picture you can see figures that seem like they are statues, could possibly be people that are crying for the invisible man as if he disappeared or died. At the very bottom you can slightly see the mans feet and something that looks like its coming out of him, almost as if he is getting rid of the evil out of him and those people to the right might be crying for him to get better. With all of the other objects in the painting, it shows that maybe everything is passing by him and not noticing him. For example people are just walking all over him not caring about his emotions. good image, but you need to describe it more formally. This commentary lacks really any description of the image, just your subjective response to it. Furthermore, it's not from the correct time period: remember, as of this week you are supposed to post and comment on a work of art from the time period we're studying that week in class.